Dr Ian McDonald, based in the School of Arts and Cultures, is Acting Director of the Research Centre for Film at Newcastle University. Ian recently received an ESRC Impact Acceleration Account award for “Algorithms: From Screen to Social Impact in India” from Newcastle University. Here he talks about the incredible journey of the documentary that began ten years ago! Initially, it was simple curiosity that got me interested in Blind Chess. In 2006, I was in India completing my first documentary ‘Inside the Kalari’ when I came across a small newspaper report about blind children playing chess. I cut out the report (for it was an actual newspaper!) and asked a few people if they knew about blind people playing chess. Nobody did. 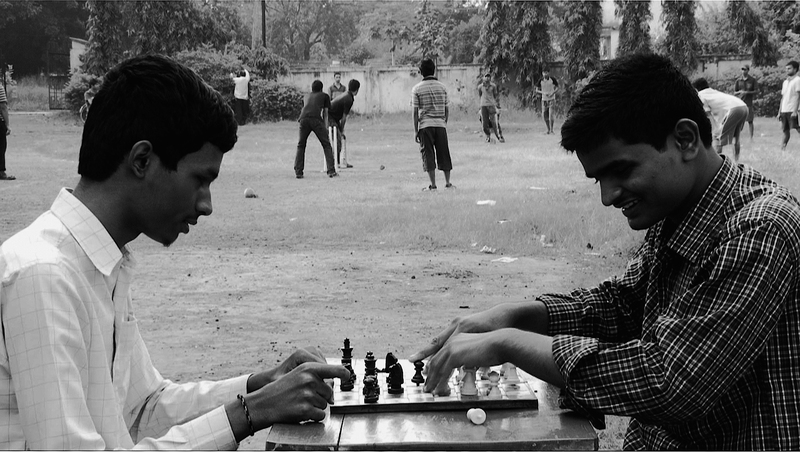 So, as someone with a keen interest in alternative cultures of sport (at that time I was also researching for a documentary on a gay football team in the UK), I started to explore the possibility of a film about young blind chess players in India. 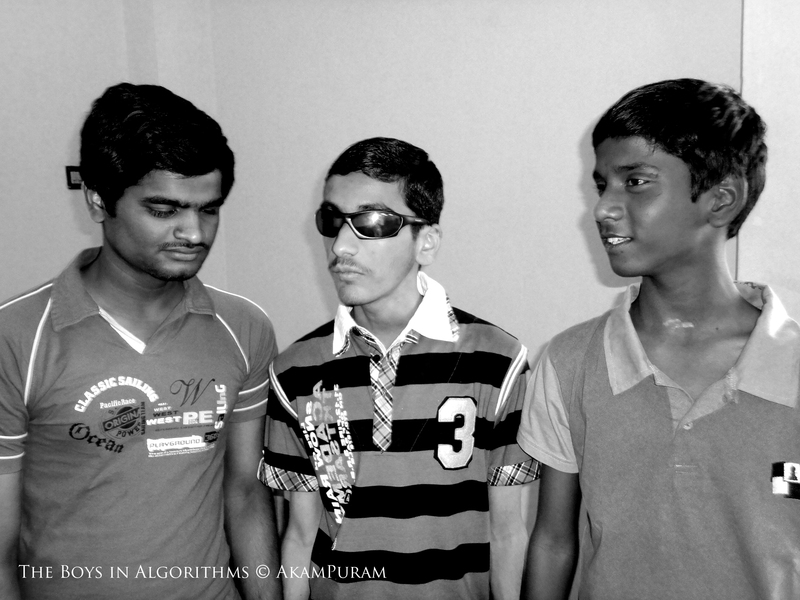 In 2008, my producer and creative collaborator Geetha J (who recently joined the University as a Lecturer in Film Practice) and I began our research that included making a short film on four blind kids called ‘Out of Our Hands’. Then we met Charudatta Jadhav from the All India Chess Federation for the Blind, who is an inspirational pioneer of blind chess not just in India but internationally. Charudatta, himself totally blind, invited us to a national tournament in Mumbai in January 2009. We were amazed to come across hundreds of blind and visually impaired players competing against each other in the tournament. Algorithms began at this point. We found our three main players – Sai Krishna 12 from Chennai, Darpan 15 from Baroda and Anant 16 from Bhubaneshwar – the three most promising juniors in India. And there was ‘Charu-sir’. What we didn’t know then was that this would be the start of a three-year shoot that would take us to numerous cities across India and to three countries in Europe! The more I got into the shoot, the more my attitude to blindness changed. I began to recognise that blindness is not a barrier to leading a full life and that blindness is better understood as a different way of being in the world, in which sound and touch come to the fore. It is almost as if eyesight has allowed us, the sighted, to lose touch with each other and our surroundings. I began to rethink the notion of sight, question the limitations of eyesight and understand the importance of foresight. There is a neat paradox here, the blind were actually teaching me, a sighted person, what it really means to see! 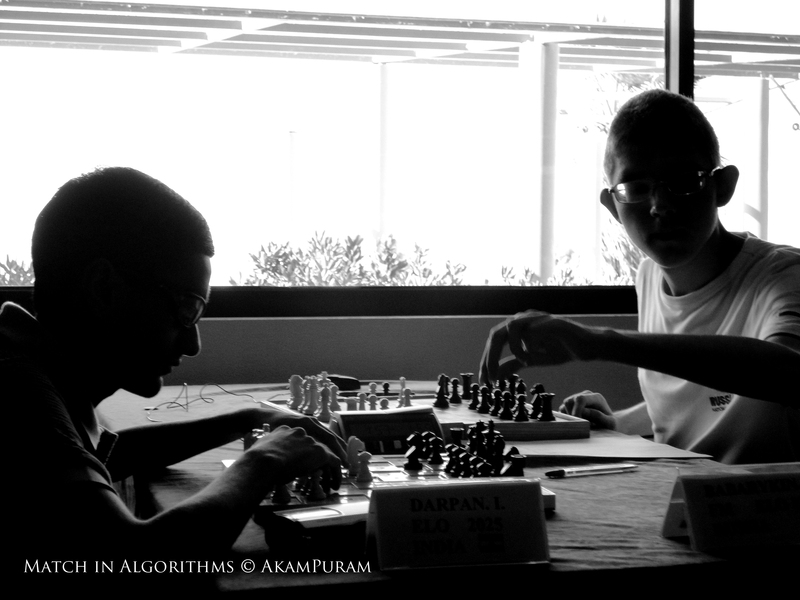 These were lessons that the blind players learnt from chess. This was Charudatta’s mantra – to be good at chess and to succeed in life, you need vision, not sight. You require foresight, not eyesight. It struck us that this was a lesson for the sighted as well as the blind. Shooting still. Ian filming Sai Krishna at his School for the Blind & Visually Impaired. I also began to appreciate the popular Indian verse: ‘sukha dukhe same kritva’ – that joy and sorrow, profit and loss, winning and losing are but the same; they torment us but we must treat them as same and engage in life. Finding hope in hopelessness and possibility in impossibility, the Blind Chess community moves forward, reminding us of the forgotten significance of touch and of the materiality of our social existence in an era dominated by the visual and the virtual. I also learnt that once you understand that “four moves in, we are all blind”; you can find your steps forward – through insight, foresight and vision. Making Algorithms has certainly changed my outlook on life! 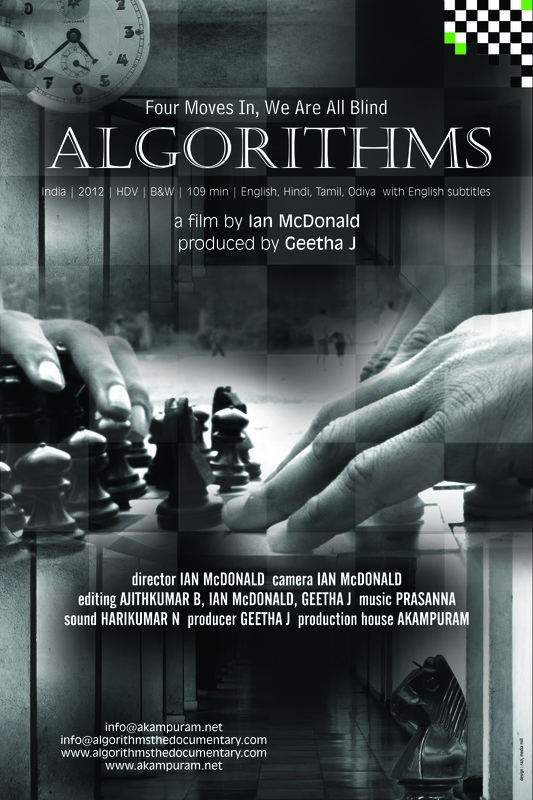 Algorithms had its very first public screening at the prestigious International Film Festival of India (IFFI) in Goa in November 2012. I remember how anxious Geetha and I felt in the run up to that first public screening. Our anxiety was not helped by well-meaning caution from the festival organisers who told us we would probably not get a big audience, after all it is a documentary, and most Indians prefer fiction and from renowned filmmakers! Indeed, less than ten minutes into the film, we could see some people leave. Geetha and I glanced at each other nervously fearing the trickle would turn into a flood. But, something strange happened. The trickled dried up. People stayed. Pin drop silence descended during the emotionally heavy scenes. Some people even started chuckling and laughing at the lighthearted moments. And a warm round of applause broke out at the end of the film. I also remember the lively Q&A afterwards that went on for 45 minutes as hand after hand shot up to ask question after question: ‘how did you get the idea for the film?’, ‘why did you make it black and white?’, ‘why did you call the film Algorithms?’. Finally the organisers pleaded with us to leave to make way for the next (fiction) film! There was a real buzz around the film and reviews of the film were positive. But our hopes that other festivals would pick the film up were dashed. Not a clear story line, too many characters, too long, no explanations, etc seemed like excuses as festival after festival passed on Algorithms. Our hope that a distributer would sign the film and take it to festivals too went unfulfilled. ‘100 mins, black and white, subtitled, and on blind chess, the conversation stops here,’ retorted one distributer. It was a really difficult time. 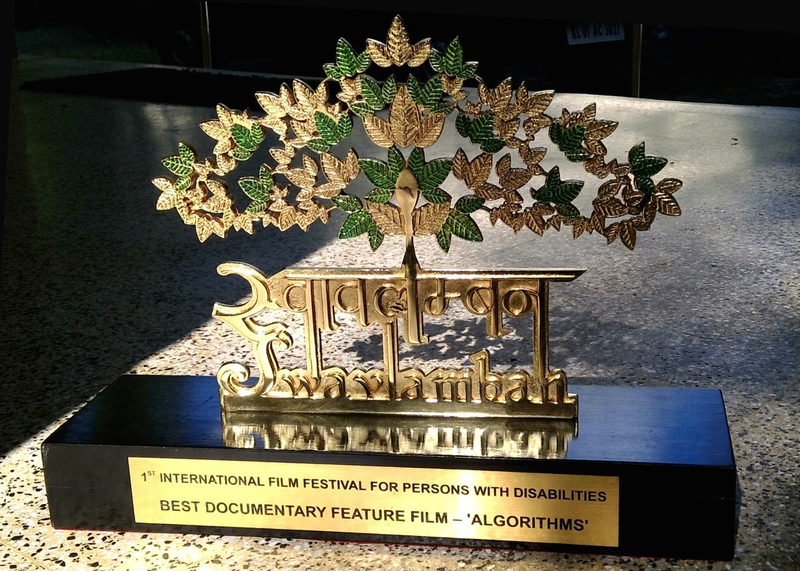 It was not until June 2013, some seven months after the world premiere at IFFI, that Algorithms got its international premiere at the Sydney Film Festival. We knew that having a good, even a very good film, is not enough for a top festival to select a film. But what we didn’t realize was how much more difficult it is when it is a truly independent film. If a film is not funded or supported from within the film industry, then it’s an uphill battle to be taken seriously by distributers and noticed by festivals. It was a huge relief and felt like a real breakthrough when we were told that Algorithms was selected for Sydney (the Director of the Sydney Film Festival had seen the film at Film Bazaar during IFFI). Geetha and I went to Sydney, of course. It is a super film festival with a great audience turn out. Indeed, Algorithms had a great response. And the reviews were not bad either! I went straight from Sydney to Edinburgh for the UK premiere at the Royal Anthropological Institute’s International Festival of Ethnographic Films, where Algorithms won the its first award –the Audience Award! A part of me wanted to send the certificate to all those ‘experts’ who claimed that audiences would not appreciate such a film! Then in July we attended the Durban International Film Festival in South Africa where Algorithms received a special mention in the Best International Documentary category! This was followed in October by our first main award – Best Film – at the highly competitive and prestigious Film South Asia festival held every two years in Kathmandu. I treasure jury chairperson Sadanand Menon’s words: “‪Once in a while, a film comes along that can surprise with the elegance it evokes through simplicity” and the citation that remarked on “the grace and near balletic finesse of the camera-work that, throughout, hardly seemed intrusive and the seamless editing that gave the film a poetic quality”. Slowly our confidence began to rise again. Many high profile filmmakers like Nick Broomfield in the UK and Shyam Benegal in India also expressed their appreciation for the film. With more festivals selections came more awards: Best Film on Immaterial Culture at the Jean Rouch International Film Festival in Paris in Nov 2013; Best Editing at the Mumbai International Film Festival in Feb 2014; Best Story at the Sports Film Festival in Moscow in March 2014; Best Foreign Documentary at the Los Angeles Femme Film Festival in October 2014 and Best Documentary Feature at the first International Film Festival for Persons with Disabilities in Delhi in December 2015. It was also nominated for a Griersons and for Best Documentary at the UK National Film Awards. And I received a Certificate for Excellence in Cinematography from the Indian Documentary Producers Association! 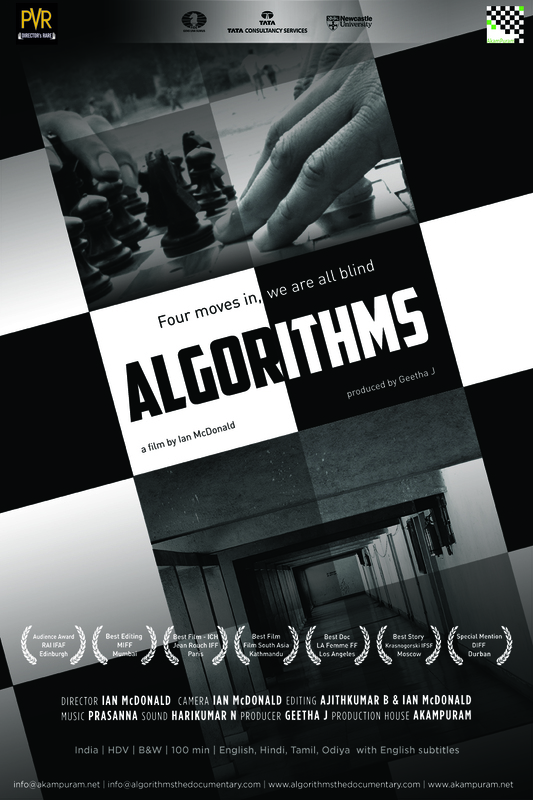 After a slow start, Algorithms was eventually screened at over 50 international film festivals and picked up more than 10 awards. But it must be said here that it was pure word of mouth that got us going to these festivals, getting awards and getting some great reviews too. It was the audience themselves who were taking our film forward. This took us to some very sensitive people in some key organisations, which led to a theatrical release of Algorithms in the USA and UK. We secured the support of Tata Consultancy Services (TCS) in India, the World Chess Federation (FIDE) and Newcastle University, and soon the fanciful became feasible. In October 2014, Geetha and I landed up in the surreal surroundings of Los Angeles. We had our preview Oscar screening supported by grand maestro A R Rahman and inaugurated by Grand Master Susan Polgar at the Directors Guild of America on Sunset Boulevard, Hollywood! After the two weeklong Oscar qualifying theatrical release in Los Angeles and New York, Algorithms made the long list. Of course, not the short-list. But through all this more and more new audiences were discovering the hidden but thriving community of blind chess players in India. And the film continued to garner some fantastic (and our first negative, it must be said) reviews. Word continued to spread. Screenings of the film spilled out from festivals and theatres to cultural institutions, third sector organisations and even at international events. One highlight was a screening at the FIDE World Chess Championship between Magnus Carlsen and Viswanathan Anand in Chennai. Such screenings helped the film develop a varied audience following. Then finally, Algorithms released in India! It was the 10th documentary release of PVR, an Indian cinema chain that backed documentaries. Supported by an award from the HASS Faculty Impact Fund, Geetha and I travelled to India for the countrywide theatrical release in Delhi, Pune, Mumbai, Chennai, Bangalore, Hyderabad and Kochi in August 2015. A new fast-paced trailer and a stunning new poster were released too. Film posters: from left to right – for Film Festival – for USA theatrical release – for India theatrical release. 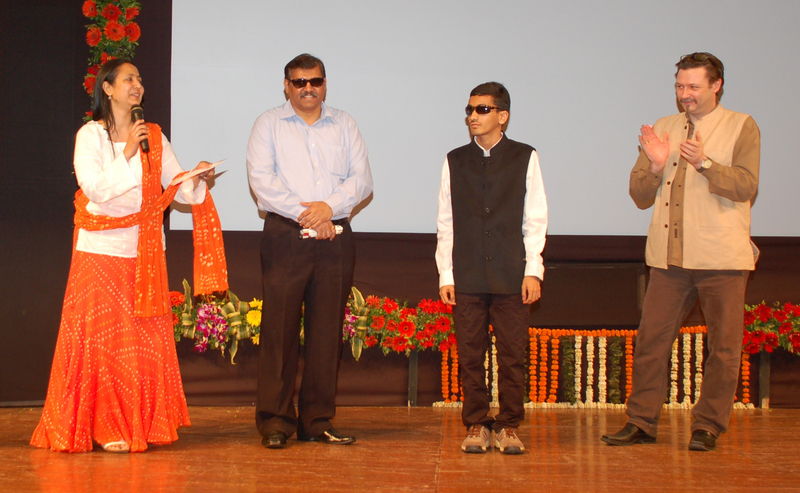 The preview to the release was unique as it was screened to a blind and visually impaired audience with an audio description. 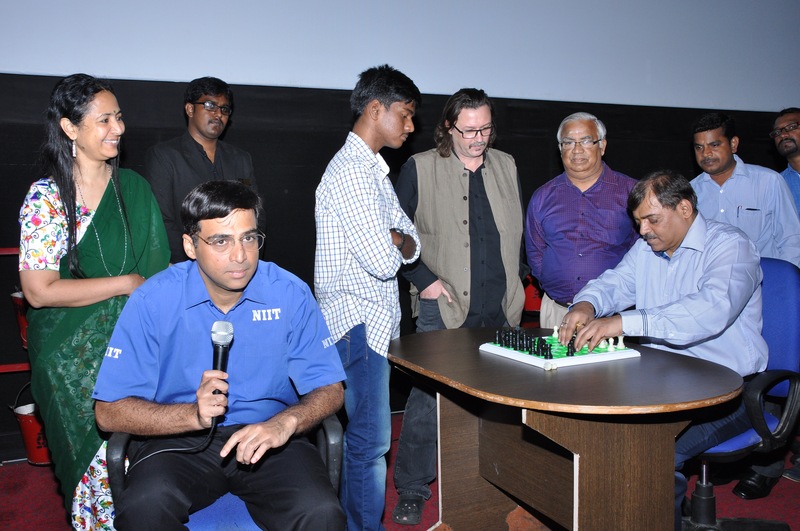 The icon of Indian chess, Grandmaster and five times World Champion Viswanathan Anand inaugurated the screening with a blind blitz match with Charudatta. This unique cinematic event caught the attention of the Indian media and provided a great launch pad for the general release. 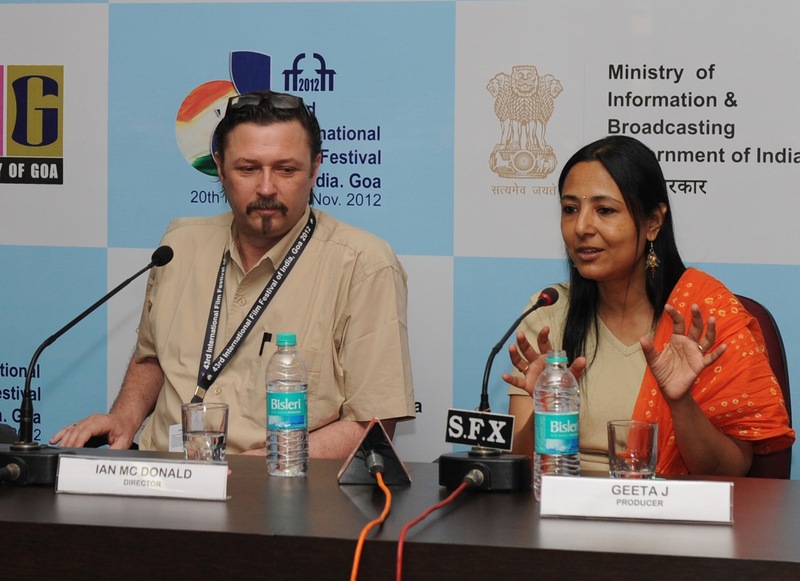 Geetha and I were forever travelling for post screening Q&As and doing interviews for the media. It was an exhausting and exhilarating experience. But it was worth it. By the end of the weeklong release, over 50 feature article/reviews of the film had appeared in the national press and millions of people are now aware of the incredible young blind chess players in their country. Now, as 2016 begins, the last leg of the journey of Algorithms begins in the land from where it all started. 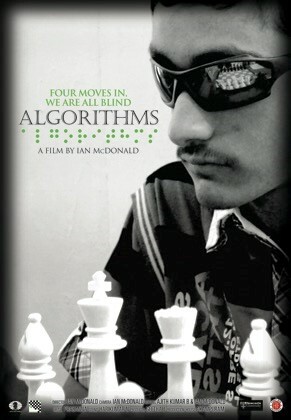 We are now working on securing support for a mass DVD release of Algorithms in India. We are adding Tamil and Hindi to the English as audio-described options. This will ensure that the film will be accessible to approximately 70% of the Indian population. And we are hoping that a sponsor will come on board to bulk purchase the DVD so that it can be given away free to blind schools and blind chess players, as well as distributed to all sighted schools, colleges and Universities. That would be a fitting and impactful end to a journey into the unknown that began 10 years ago, when I chanced up on that small newspaper report about blind children playing chess. For more details about the film.